For eleven years, I was an English teacher in Japan. It still feels strange to say that I’m no longer teaching and no longer living in Japan. Part of me feels like I should still be there teaching. You know the feeling? You know things have changed, but part of you doesn’t want to accept it. I missed the teaching. And then I started working at a science centre. Every day that I work, I’m teaching people (usually children) about the planets, physics, and occasionally bird feathers. I’m finding that I’m loving seeing kids enjoying learning about science. Science was my first love. Teaching English was an incredible experience, but now I’m helping to teach science to people, although not as a teacher. Today, I spent forty minutes talking to a woman (half in the planetarium, half in the gallery) about astronomy, science centres, and life experiences. It’s that kind of interaction I love. I enjoy talking to people about science and helping them learn something new. That brings me to what I’m going to be doing very soon. And that is starting a science channel on YouTube. Science education and science literacy are very important to me. I want to help people understand that science can be interesting and fun. But I also want them to understand that without science literacy, society can’t advance. It’ll stagnate or even regress. I want to combat scientific illiteracy, pseudoscience, and misinformation. There’s too much of that going around these days. I’m hoping that through the science channel, I’ll be able to help people learn science and enjoy it. While I’ll be doing the videos on my own, I’m hoping people will share the videos and help spread the word about my channel. I want to reach as wide an audience as possible. While I may be only one person, I hope I can change some minds about the importance of science. I still have some work to do to prepare my new channel. I still need a name, and I’d like to work on a schedule for it. I plan on doing two videos a week. One talking about weekly science news stories, one doing specific topics to help educate people about science. I’ll focus mostly on astronomy, physics, biology, geology, and palaeontology. So, who’s with me on this? Yesterday, my daughter was talking to me about her day at school. She and her friend pretended to be Pokemon. Her friend was Pikachu, while my daughter was something I’d never heard of, at least in Pokemon. The word she used is a real word, but no Pokemon has that name. I was surprised and confused. But most of all, I had to laugh. The name was hilarious. And guess what? I got it all on video. I bet you want to see that video. You won’t regret it. Check it out. It turned out that she couldn’t pronounce the name of the main character, Ash. But still, it was very funny. Kids can say the funniest things. For those of you who have children, what are some of the funniest things they’ve said? Let me know in the comments below. She looks innocent, doesn’t she? That was her at the playground earlier today. She ended up going to bed a bit late tonight, but she spent two hours moving around, talking, and making a poor attempt at sleeping. I’m tired. Anyone else have trouble getting their kid to bed? 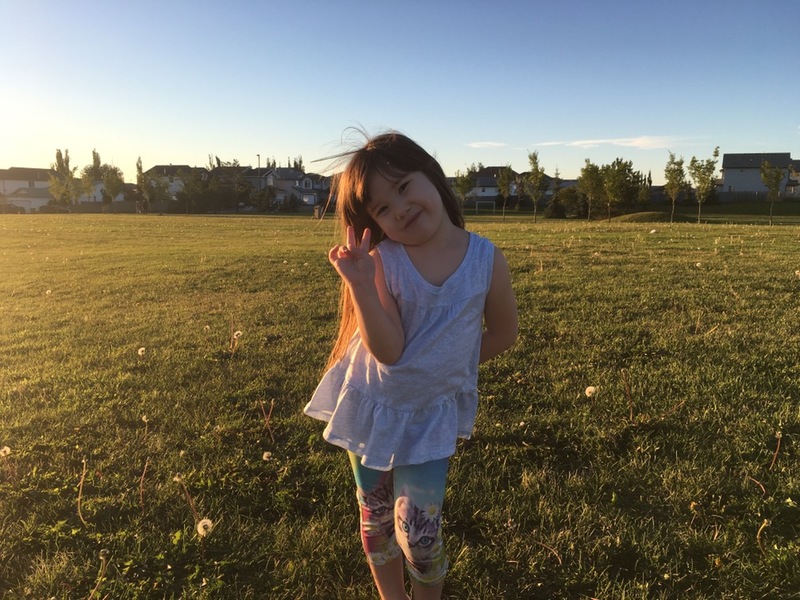 Now more than four and a half years old, it’s hard to believe it’s been so long since she was a non-verbal baby. Now, she talks. She talks non-stop! It doesn’t matter if it’s in Japanese or English, she will continually talk until everyone is hoping she’ll be quiet for a few minutes. The rate at which she’s acquired English is amazing. She’s become conversational in English, although her grammar is still odd. That’ll sort itself out over the next year, I think. She still lacks vocabulary, but she’ll learn quickly. School starts in September for her, so she’ll have a great opportunity to speak more. But there’s something I’ve noticed this week. She can negotiate. She’s a bit manipulative. She’s stubborn. And she is very strong-willed. She wanted something to eat, and she asked for three of something (I don’t remember what!). But that was too much. We said just one. She settled on two, and we said okay. And tonight, while going to sleep, she was being so incredibly cute, I would’ve loved to have had the conversation on camera. She wanted to hold our hands, then she wanted my wife and I to hold hands. She said she loves us, and we’re her best friends. She was very happy to have us cuddling with her. She was happy to just be with us. We’re doing something right. She’s actually quite generous. She’ll ask for some gummies, candy, or something else, and she’ll give everyone a piece. She likes to share. But she can be bull-headed and refuse to do things when we ask. I always have to talk to her about not listening to us, and she always apologises. Have to be stern with her sometimes. But in the end, she’s happy. My daughter is a climber. She’s fearless. She will climb anything, and will get up pretty high. She has a very strong grip and sure footing. I think she’s going to be a rock climber. Although she’s only four years old, she seems to have little trouble getting up anywhere. She played with a boy who was about a year older than her, and his father had him wearing a bicycle helmet to climb onto anything. But I noticed that my daughter climbs faster than him, and has far better technique. You may ask if I’m afraid if she’s going to fall. Sure, I’m worried about if she falls, but I can’t hover around her. She needs to learn to be independent on the playground, make friends by herself, and resolve conflicts on her own. I’m not going to be the kind of parent who micromanages his child. I’ll make sure she knows when she’s doing something she shouldn’t be doing, like throwing sand or pushing other kids. I’ll let her climb up the slide backwards. 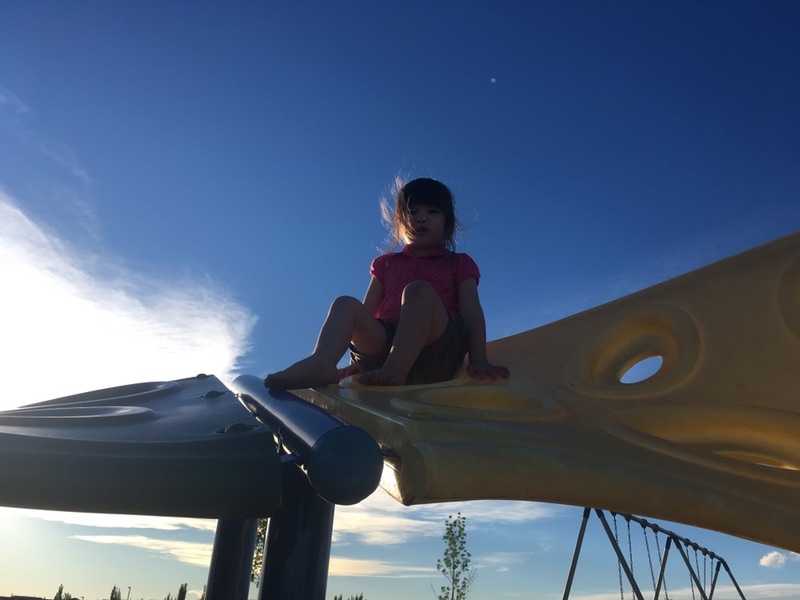 Lots of kids do that, and it allows her to use the playground equipment in her own way. I’ll let her make her own mistakes. If she falls and gets a scrape, this only helps her learn. I sit back and just watch. I want her to become independent, use her own judgment, and learn how to take care of herself. And maybe she will become an amazing rock climber. My daughter has a big imagination. Some of the things she comes up with are silly, crazy, or unbelievable. I already have an idea of hers that I’d like to develop into a children’s book about dinosaurs. I sometimes think that adults make things overly complicated. When we think of ideas for a story, we make it more complex. But to think at a kid’s level, we need a kid’s mind to give us the best ideas. I find that a lot of my daughter’s ideas are linked to reality. The things she thinks of are related to recent events, TV shows she’s watched, or topics she’s interested in. At the moment, she likes to play princess. But she’s also interested in driving recently. She loves making the turn signal sound now. Not particularly useful for a story, but she includes these little things in her play. Tonight, we went to the playground, and the entire theme of her imaginary life was a princess going to McDonald’s for hamburgers and chicken nuggets. At home, she’s often a pony with a towel for a tail. She especially likes unicorns. And now, she’s got a pony flying around (My Little Pony) fighting with Anpanman. I’ll have to keep notes of her ideas. Maybe someday I’ll write about them. For those of you with children, do you have any funny stories about your kids’ ideas? Let me know in the comments below.